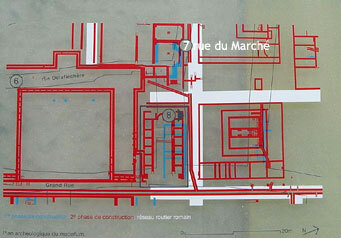 The drawing on the sign shows the functioning of the mosaic, the hypocaust system for the baths and the hot room. The text in English reads: The public baths - Very close to the forum, and dating probably from the beginning of our era, were the public baths, or therms. 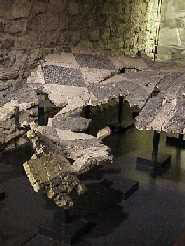 Excavations have revealed the room for hot baths, caldarium, that for cold baths, frigidarium, and the tepidarium, which served as a transition between the two, and possessed a floor decorated with a geometrically patterned mosaic that is now in the museum. The therms were indispensable for the social life of every Roman and Romanised city, where they offered relaxation, a meeting place, and bodily care. Frequented equally by both sexes, the establishments were either separate, or observed different entry hours. Above, the mosaic from the tepidarium in the baths as it is shown in the Nyon Roman Museum. Click on the picture to go to the Museum's web page about the baths. 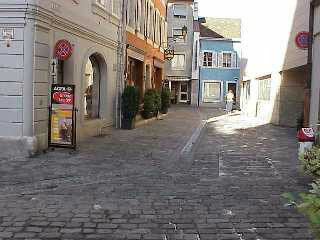 Looking up and down the rue du Marché at the place of the sign. 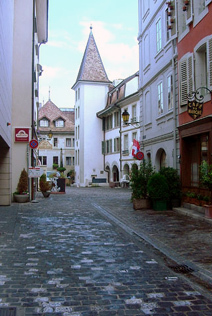 Click here to go to the Nyon Roman Museum's page about this area of town. 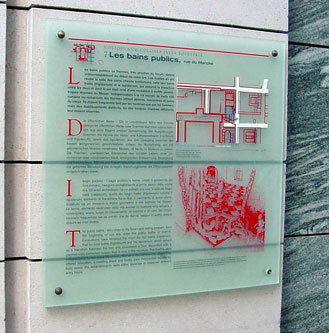 Read (in French) about, and see pictures of, the archaeological investigations of the baths by Archéodunum S.A.
Click here to learn more about the role of the public baths in a Roman's life.